In a recent gloomy study of the American economy, Thomas Piketty, Emmanuel Saez, and Gabriel Zucman find that almost none of the gains from economic growth accrued to the bottom half of the population. 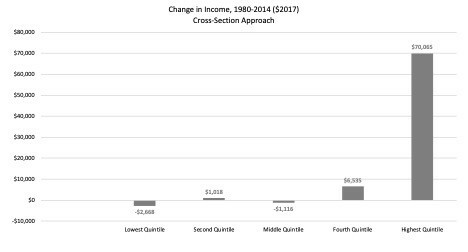 They write, “Looking first at income before taxes and transfers, income stagnated for bottom 50% earners: for this group, average pre-tax income was $16,000 in 1980 — expressed in 2014 dollars, using the national income deflator — and still is $16,200 in 2014.”¹ Piketty, Saez, and Zucman also found that incomes of the top 1% tripled over the same time period. Writing in Vanity Fair in 2011, Nobel Laureate, Joseph Stiglitz wrote: “All the growth in recent decades — and more — has gone to those at the top.” All. And more — implying that everyone else is losing ground. Studies that use panel data — data that is generated from following the same people over time — consistently find that the largest gains over time accrue to the poorest workers and that the richest workers get very little of the gains. This is true in survey data. It is true in data gathered from tax returns. 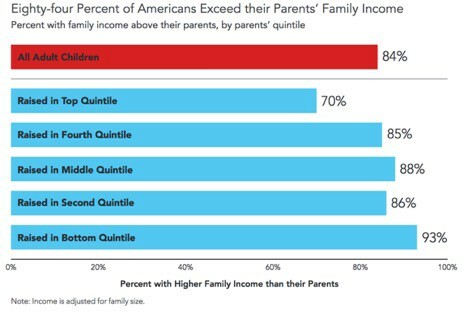 One explanation of these findings is there is regression to the mean — if your parents are particularly unlucky, they may find themselves at the bottom of the economy. You, on the other hand, can expect to have average luck and will find it easier to do better than your parents. At the other end of the income distribution, one reason you might have very rich parents is that they have especially good luck. You are unlikely to repeat their good fortune, so you will struggle to do better than they did. 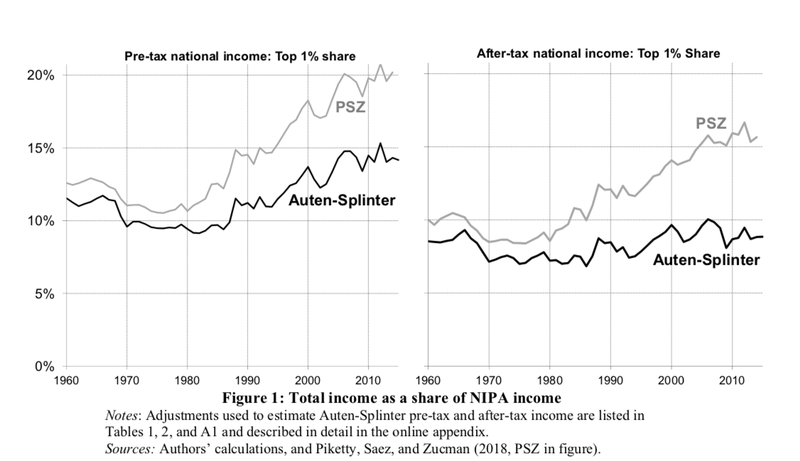 Splinter reminds readers that the pattern here is more important than the size of the changes — he points out that tax returns grossly understate actual income, capturing only about 60% of the total in recent decades. And some of what he is capturing may be life-cycle effects that differ by quintile. But his findings are a dramatic example of the potential of cross-sections — two snapshots in time — to mislead compared to a panel approach where the same people are followed over time. All of these examples are about absolute mobility — how much income people gain over time. Relative mobility remains relatively small. 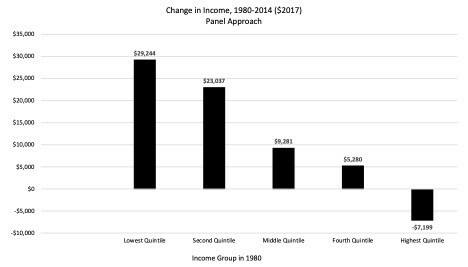 While rich people in 1980 actually lost ground 34 years later on average, they still have a much higher income on average than the people who were poor in 1980. But the income gap between the actual people in 1980 actually got smaller over time at a time of economic growth. This does not mean that everything is fine in the American economy. There are special privileges reserved for the rich that help them reduce their risk of downward mobility — financial bailouts are the most egregious example. There are too many barriers like occupational licensing and the minimum wage that handicap the disadvantaged desperately trying to succeed in the workplace. And the American public school system is an utter failure for too many children who need to acquire the skills needed for the 21stcentury. But the glass is at least half-full. If we want to give all Americans a chance to thrive, we should understand that the standard story is more complicated than we’ve been hearing. Economic growth doesn’t just help the richest Americans. One of the reactions to this essay is that of course household income has gone up — that’s because there are so many more households where both the husband and wife is working. Another version of this is that in the old days, one person working could support a family, now you need two, so we’re falling behind. 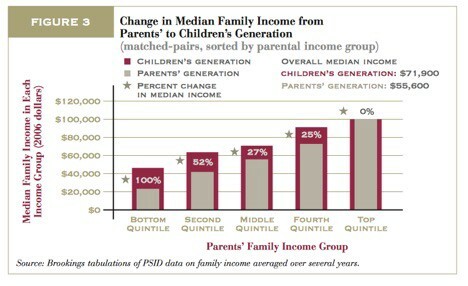 Actually, the cheerier studies I’ve mentioned above look at individuals, not households. But it is worth noting that the proportion of households with two earners has actually decreased since 1980. (See Table H-12 here from the Census Bureau.) That’s because while more married couples are households where both spouses are working, the marriage rate has fallen. So in 1980 (when the Census data starts), 33% of households had two earners but in 2017 it is only 31%. Since 1980, the number of households with zero or only one earner has risen from 56% to 60%. Another point that readers have raised is that percentage gains can be misleading — a 100% increase from an income of $10,000 is only an additional $10,000. That is dwarfed by a 5% increase for someone making $1,000,000. So yes, percentage gains are not all we care about. 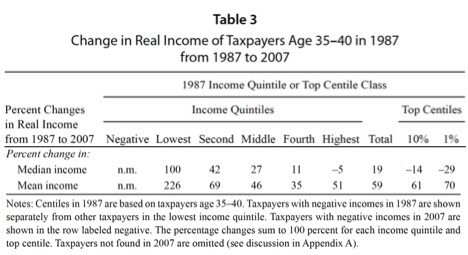 Most of the studies above show that the poor and the middle got larger absolute gains as well. The exception is the Auten, Gee, and Turner study that only shows percentage gains. Their paper simply doesn’t report absolute gains.